Hello everyone. I am so sorry I’ve been so MIA. A whirlwind of things have been happening in May and I have TONS of things to post about (like my healthy fiesta recipes I had for Cinco De Mayo and my trip to New York). But right now, I’m wrapping up an 8-day long epic adventure in Oklahoma. I leave tomorrow morning and boy, AM I BEAT. I am seriously exhausted. But honestly, while a stressful and high energy trip, I really learned a lot and it’ll be one of those experiences I’ll remember forever. Working for Samaritan’s Purse, I’ve only really been sent to one other disaster relief site and it was a tiny one in Georgia, 5 hours away and only for two days. This one was much more involved and much more of a disaster. 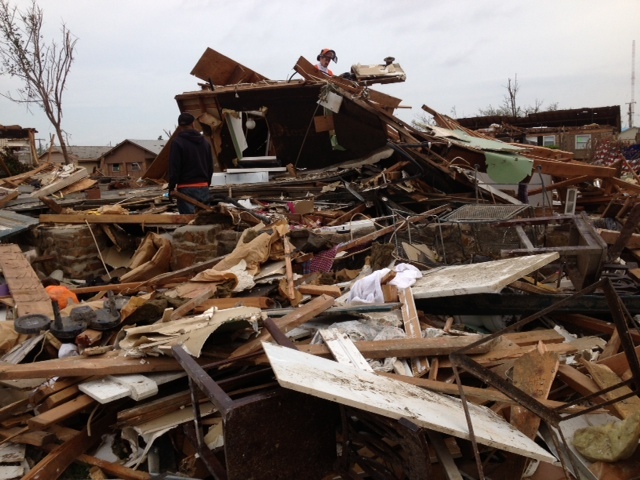 The tornadoes that hit Moore and Shawnee were just catastrophic. Words cannot even give the whole situation justice. The moment I drove through the disaster zone, I wanted to throw up. It felt like my heart had hit my stomach. I talked to people who lost everything. I met a couple whose nephew died. I met an old man whose daughter found the body of a victim completely decapitated. I saw the marked crosses at the school where the children died. I spent countless hours talking with homeowners who just cried and cried and all I could do was just talk with them and take notes. And then I’d come across some homeowners who, while completely devastated, could only crack jokes and eerily laugh while tears still lingered in their eyes, just waiting for a moment to fall once I turned around and left. 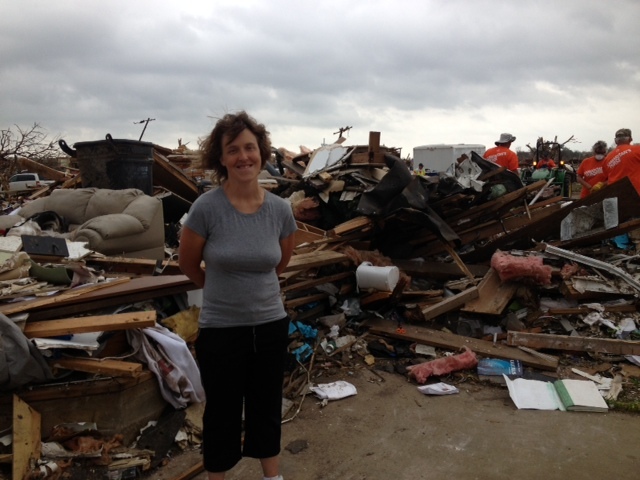 On my birthday, I stood in one of the hardest hit areas with a woman who was searching with Samaritan’s Purse volunteers for personal belongings in the rubble that was once her home. She was alone because neither of her two daughters, 10 & 13, wanted to come back to the house. The thing she wanted most was to find the hand scribbled song lyrics one of her daughters had written. I was there when she found a song. She was very happy, but at the same time disappointed because she was hoping to find a binder and in that moment, she realized there were only single sheets of paper haphazardly blowing about with these songs written on them. And yet, she was hopeful. It was after that homeowner that I honestly just got in my car and cried, and then like the emotionally-eating fat kid that I am, I found the coolest local bakery ever and bought myself a tiny cake. And I wrote a story about that lady between mouthfuls of sugary goodness and my own tears in my hotel room. I cried because after all of this, she was smiling in this picture. How was she smiling? I couldn’t take it. Don’t get me wrong. My birthday wasn’t bad. Besides, I’ve already explained to you all about the importance of having a good cry before writing an awesome story. In fact, I had MORE people sing to me that day than I ever have my entire life. Seriously…hundreds of people. It was almost embarrassing. What was even more embarrassing was how apparently some people thought I was in high school (not sure what was wrong with their eye sight there…). Plus, a coworker took me to one of my favorite restaurants for lunch. Totally the makings of a nice birthday, even if it did start with some tears and the smells of rotting meat in the street. And then there was a night I’ll never forget where I had to stand outside in lightning, waiting to see if we had to go into underground bunkers (which we did), and then later watched as power lines fell on our cars and started a fire nearby. (You can read about it here). 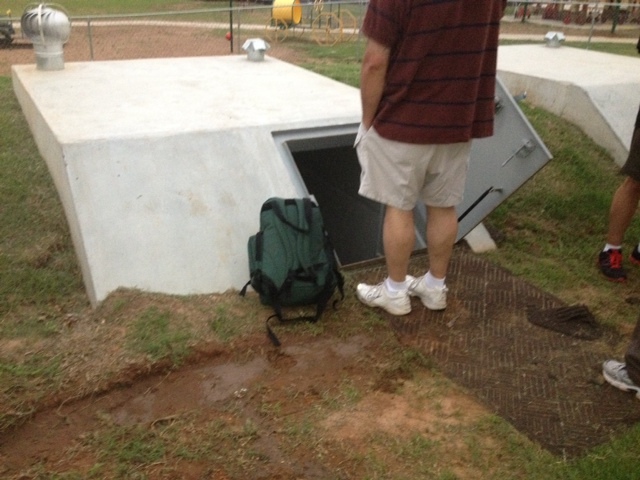 We had a cozy good time getting to know each other under ground. But you know what? Despite the devastation, the crying, and the hiding in an underground bunker, I wouldn’t trade this time here for anything. Now, I’m not saying I’d move to Oklahoma. But I’ve seen hope in a way most people forget exists. I’ve seen joy in the sense that is actually genuine in its non-circumstantial form. And I’ve met the coolest people EVER. Earlier this month, I was completely overwhelmed. And honestly, to some extent I still am. But this week I learned the real definition of overwhelmed– not in my own feelings, but in watching those around me pick themselves up out of the rubble and figure out how to start over. This was a trailer park. It was directly hit by the tornado. Mangled pieces of metal intertwined with other mangled pieces of metal and people had trouble figuring out which parts of what were their homes. And after what I observed, I realized no one has the right to complain about being overwhelmed over stupid things because each and every day we are so blessed beyond measure. So blessed, in fact, that we cannot even begin to comprehend what being overwhelmed really means. Trust me. I saw it. I saw it on the faces of people who lost everything. You, my friend, are not overwhelmed. Maybe you’re seriously whelmed right now, and that’s okay. But you can get over it. You can fight through it. And you can stop pitying yourselves. 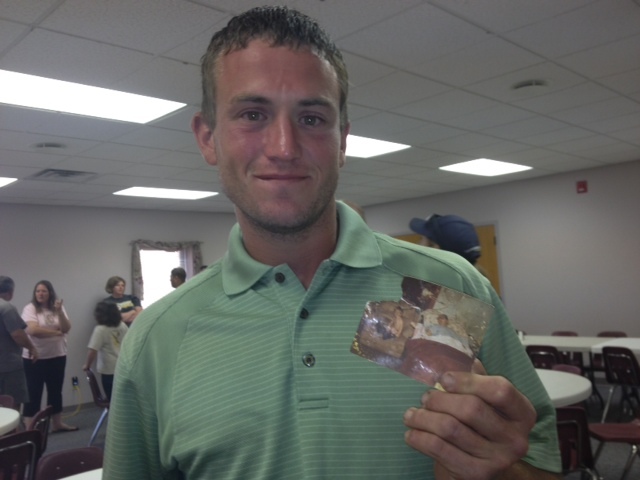 When you see a grown man break down into tears over how grateful he is that volunteers helped recover a picture of him and his deceased grandfather from when he was two years old, you’ll understand why you have no room to complain. Ever. Again. I’ve decided Okies are among the most resilient, nicest people I’ve ever met (and bravest for living here!). Honestly, while I pack my suit case right now for my early a.m. flight, I’m wondering when I’ll get to come back here again to write for Samaritan’s Purse. I know I’m not done here yet. And there’s more stories to be told. It’s been an honor to tell them. 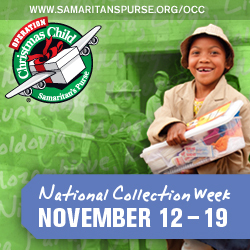 If you want to donate to Samaritan’s Purse Disaster Relief, here’s the link. Wow Nikki …. this was so beautifull written, it gave me goosebumps! STL got hit by the same storm system (not nearly as severe) and it was quite scary. Our tornado sirens went off and everything. 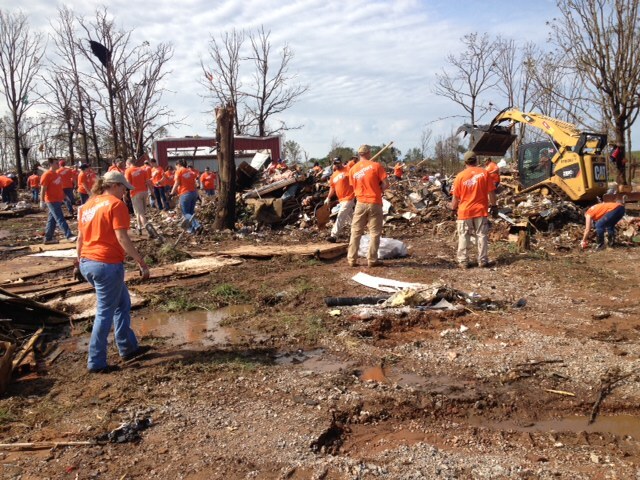 A coworker of mine lost family in the Oklahoma tornado and I had friends that went through the Joplin tornado. Tornado’s are terrible forces of nature. Thanks for sharing your photos and experiences.